The previous header photo was of the legendary Stuart Walker, on the plane in his International 14, US 578, a Fairey Mk VI. The photo was taken in 1956. The crew was his college room-mate. If I remember correctly, this photo was included in one of his first books, "The Techniques of Small Boat Racing." This past November, age 95, Stuart Walker passed on. Stuart readily admitted that, if he won on the weekend, it set him up for a happy week; if he lost on the weekend, the following week was not happy as he analyzed and came up with a plan to return to the top. The result of this constant striving to be a winner was a spate of books and magazine columns that covered all aspects of winning sailboat races; boat handling, tactics, tuning, weather, psychology and sail trim. For my generation they were the bibles and they were frequently referenced in post-race kibbitzing. Most of Stuart's writing on tactics and wind were of his own races, good or bad, and he could present his failures with unvarnished clarity. "My disastrous showing in the Ice Bowl of '68 prompted my competitors to remark that I wouldn't write that one up for publication. However, disaster to me is a challenge which demands the salvage of some profit. I barely fought my way out of last in the final yards of the race but I learned something and I can write about it!" This past August, Stuart had a party down at Severn Sailing Association to introduce his latest book, a history of Severn Sailing Association. I bought the book. I've owned several of his books, which I read cover to cover, but they seem to have gone missing. In my library, Stuart's last book will have to do. He will be missed. 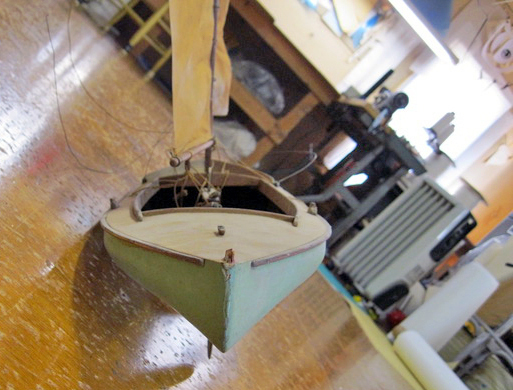 Every once in a while I get dragged into trying to identify an obscure vintage small sailboat. 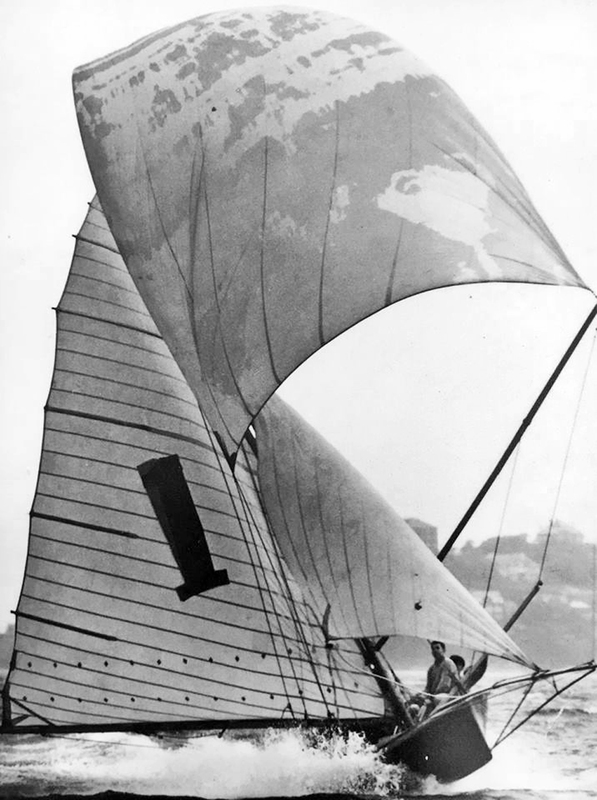 I find it fun in a way; a test of your knowledge of sailing history. Photos of the model on Doug's loft floor. Doug was wondering if the model was a early rendition of an International Canoe and was missing the sliding seat. This started a back and forth between several "experts" which I'll detail in Part 2 of this series. Music Whenever: Rufus Wainwright, Sting, "Wrapped Around Your Finger"
Rufus Wainwright is best known for the lush orchestration and the Broadway show tunes vibe of his songs. No surprise that we have the same here with Rufus, Sting and a large ensemble coming together in this very cool version of Sting's "Wrapped Around Your Finger". 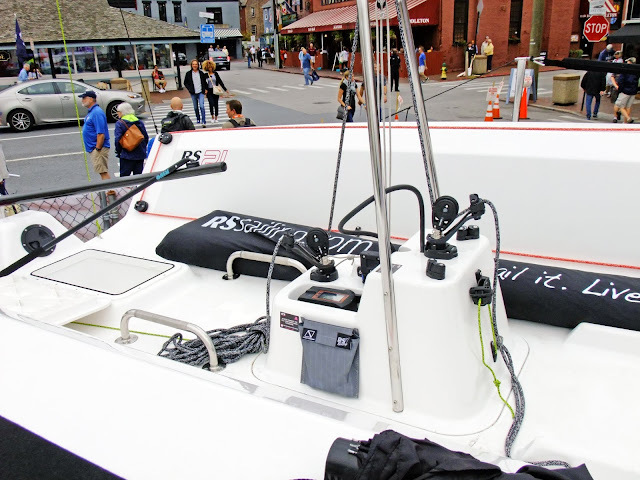 Three Rivers Race: I can't get enough of Dylan Winter! 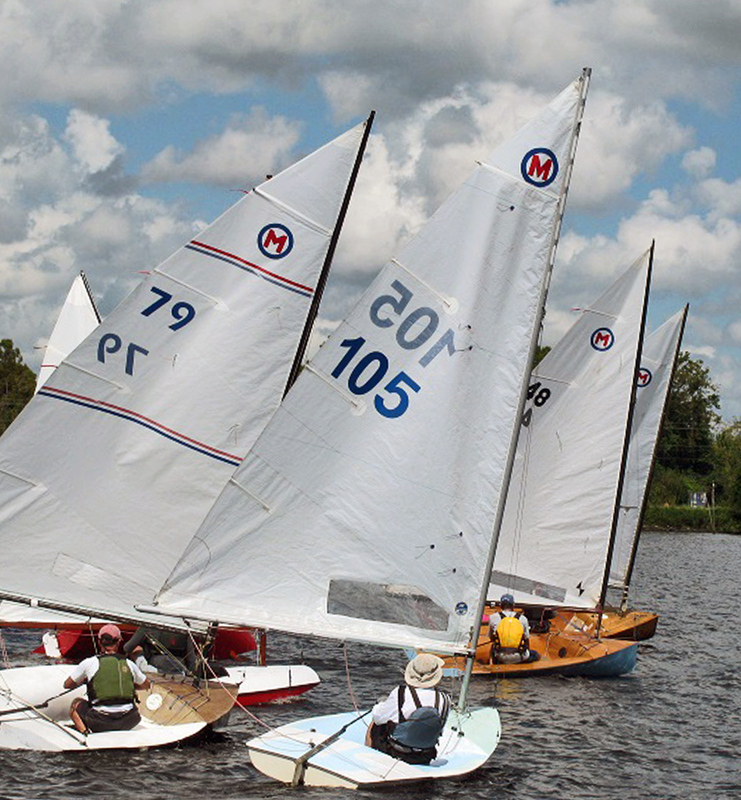 If I had a bucket list (which I don't; I am more of the type to play it by ear, see what life offers up, and see what falls out), racing in the U.K Three Rivers Race on the Norfolk Broads would be at top. I have written several posts over the years about the Three Rivers Race, most of the posts featured the superb Dylan Winters videos which have since disappeared. 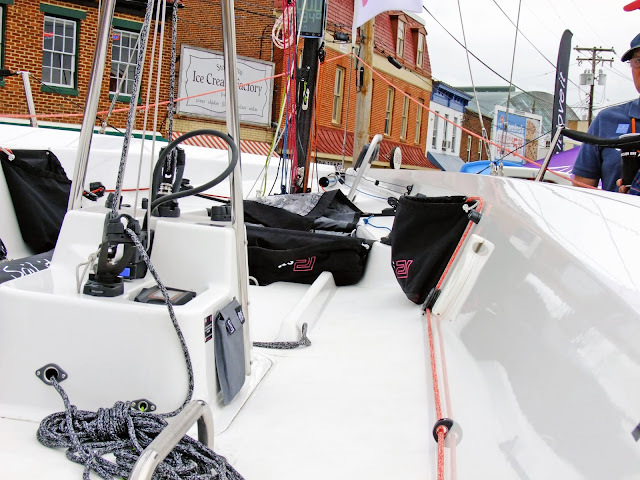 However, this Dylan Winter video on the Three Rivers Race has resurfaced and is a perfect summery antidote for a Mid-Atlantic evening where we are bundled up in an early December cold-snap and the temperatures at night have been dipping well below zero. Dylan Winter is asking those who enjoy his videos to consider contributing some cash. His website is over here. I've written about the 12 sq. meter Sharpie before in Earwigoagin. (The Sharpie was the doublehander class at the 1956 Olympic Games.) Here is a video about the small fleet of vintage 12 sq. meter sharpies based out of the tidal rivers of northern Norfolk, U.K., done by one of my favorite sailing videographers, Dylan Winter. Dylan Winter started off documenting his circumnavigation of the U.K. coastline in a Mirror 19 (under the "Keep Turning Left moniker"), then put his videos behind a paywall, and has now brought them back out in the light for public viewing. I am always fascinated by odd-ball, local fleets of one-designs. The 12 sq. meter Sharpie has the added photogenic quality of being gaff rigged. Where in the heck is sailing going? 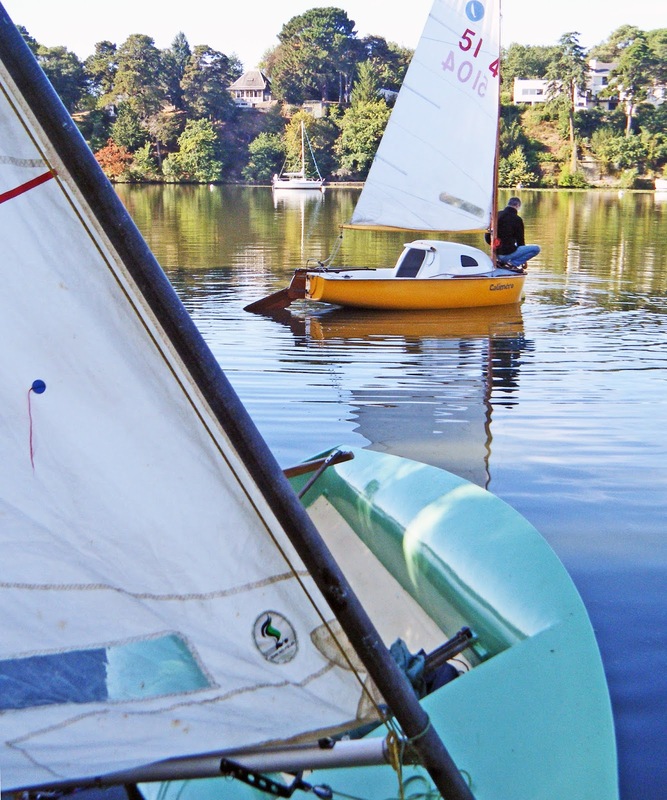 The only population segment where sailing is growing is with the old farts. They are retired and have the time and money. Everywhere else it is declining. Those with families are running their kids around to their activities, which have grown exponentially. Sailing is not a family activity anymore. Most worrisome is the millennial's. They are not interested in how we have set up sailing over the past 70 or so years, with private clubs and weekend racing. They are not interested in hard-core competition, they are into shared experiences with friends. 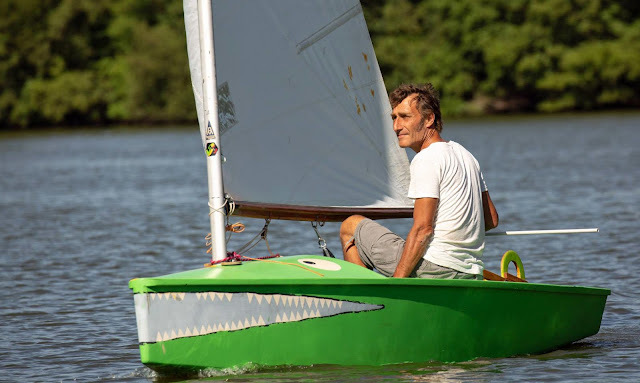 If you have a class where it is expected that you need to be mucking around with your sailboat during the week to prepare for the weekend wars - you may be headed the way of the dinosaurs. The millennial's aren't into that either. Liz is pushing for a complete rethink. Shall we blow it all up? Coincidentally, last weekend I had a 15 minute conversation with Jonathon Phillips, the new commodore of Severn Sailing Association. 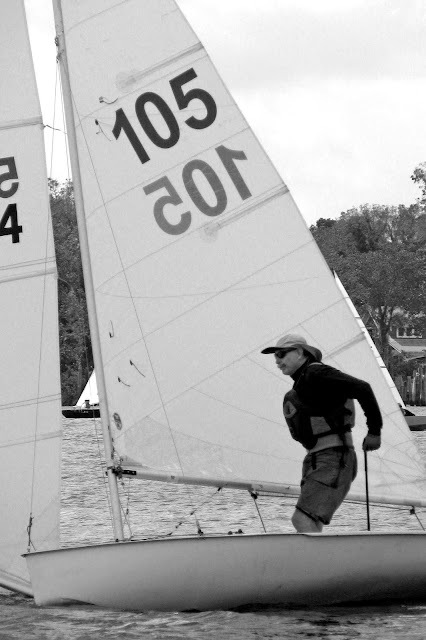 Jonathon has a very solid dinghy racing pedigree, in both the Laser and the 505. He was rather non-committal about what and by how much Severn Sailing Association need to bend their very strong racing program to this new data. He did say that millennial's, when confronted with the much higher dues rate for the club boat model, they generally head for the door. 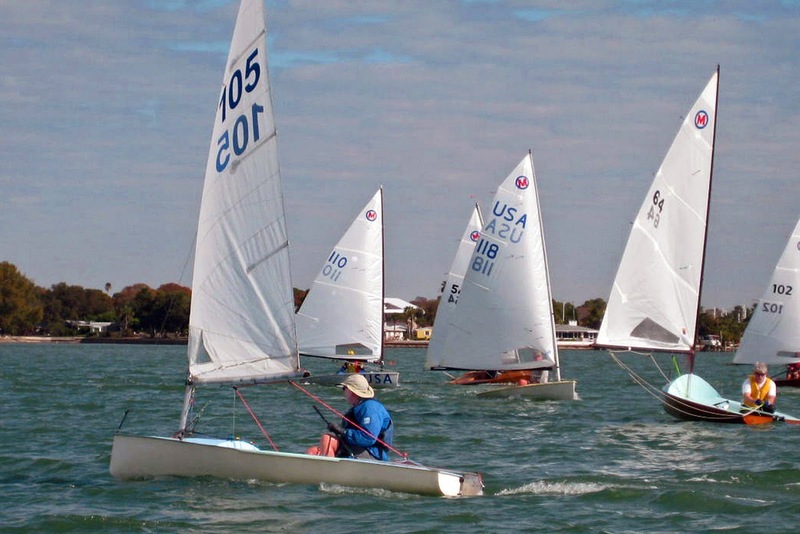 He acknowledges that new boat prices, even for sailing racing dinghies, are generally out of reach for many millennial's (and if we believe the marketing survey, they don't care anyway). Two years ago I wrote this post: Whither the Millennial's. It's worth reading the comments to this post as those who put a comment up are close observers of the sport. I've dragged two comments from two of my favorite bloggers out into the main post. From Kiwi Alden Smith. "I think the worriers and hand wringers with their evangelistic attitudes to maintaining and increasing sailing, with their plans and graphs and charts and mission statements about growth should simply stop worrying and go sailing. Future generations will choose how they will use their leisure time themselves. "Personally I don't need a fancy yacht club with tennis courts and swimming pools, or 200 boat regattas, or harbors and marinas crowded with big fat old yachts to enjoy sailing. 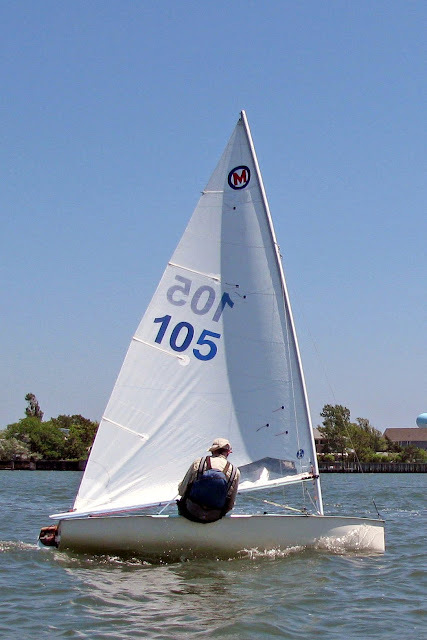 All I need is about 6-10 friends who want to race the same small singlehanded boat as me and I am happy. I have enjoyed doing that in Lasers, Sunfish and RS Aeros over the years. If others want to build wooden boats, or blast around on a kiteboard, or potter around on a boat you can sleep on and poop on, then good luck to them. The Contender: Always on the Outside Looking In! Speaking about singlehander classes trying out for the Olympic circus, one cannot forget the Contender. 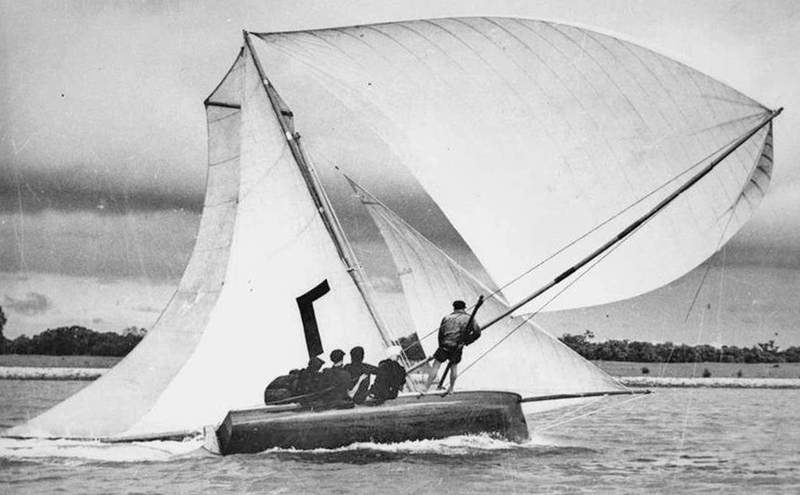 This Ben Lexcen design was a winner over a set of three singlehanded trials in the 1960's with the express aim to replace the Olympic Finn. Never happened. This didn't stop the class from prospering. 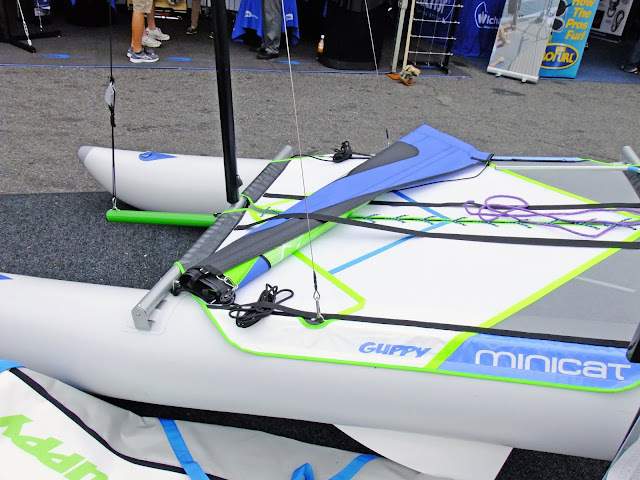 Another set of great videos from the same videographer that brought you the Garda Europeans for the Europe Dinghy, featuring the Contenders and their jolly skippers on the trapeze. 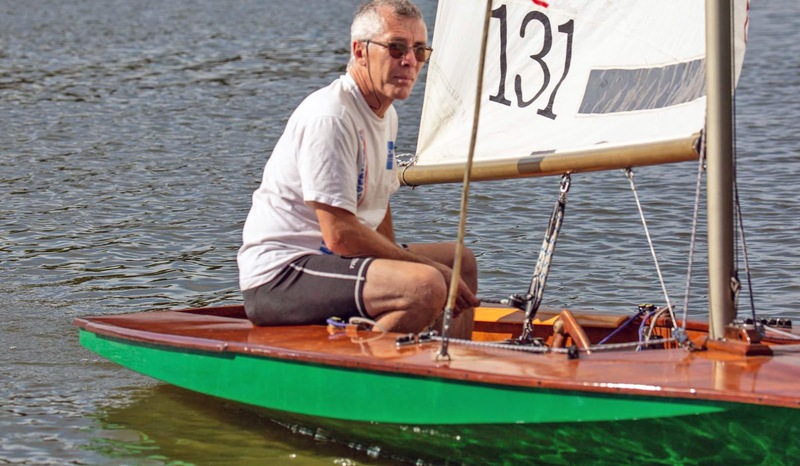 The Contender is one of the few International classes where wooden boats (in this case beautiful cold molded versions) remain competitive. Huzzah! Huzzah! for classes that have woodies racing for their championships. One couldn't help but notice the small keelboat jammed right up against the fence line of the Sailboat Show. She was tucked into the corner facing Annapolis's dockside restaurant row and sported all the accoutrements of modern keelboat design, reverse bow, bulb keel, skinny rudder, assymetric spinnaker. Once inside you discovered this keelboat, the RS21, is RS Sailing's new entry into the day keelboat market, the design brief targeting the emerging club keelboat market where the sailing club buys the boats and the sailors pay an extra fee to climb aboard and race. A photo of the cockpit looking aft. 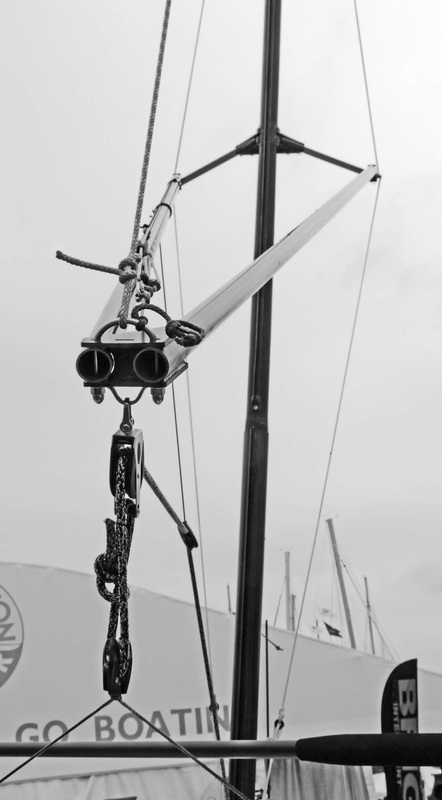 Two mainsail cleats; the forward one for the mainsheet trimmer when going upwind, the aft one for the skipper or trimmer that has moved aft for the offwind legs. Looking forward it is a very clean cockpit. 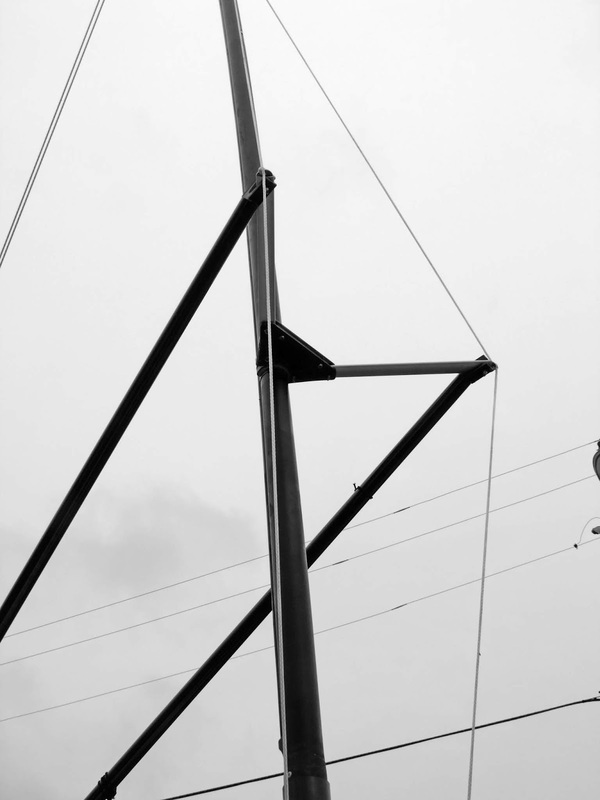 The business end of the mast. Plenty of controls to keep the crew occupied. 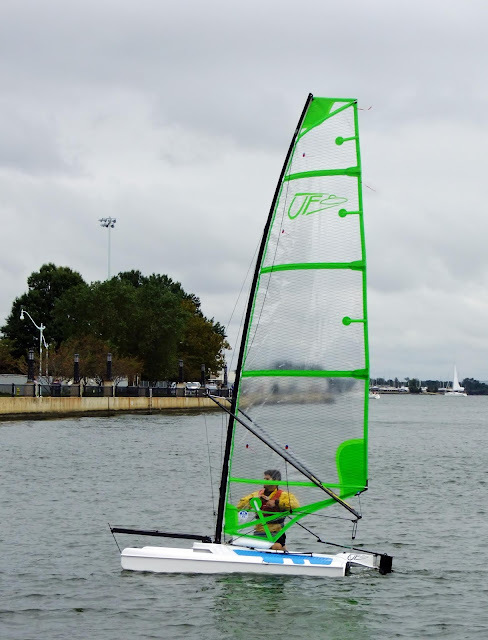 Some videos of the RS21 on the water. I would have to say the RS21 most closely matches the market where the popular J70 currently dominates in the U.S.A.
D Zero Video: Is this the one? I don't really keep up with the machinations of ISAF or World Sailing or whatever the international governing body of sailing is called now - I really only have x-amount of aged grey matter to devote to all the digital information flowing in daily. I did read that there was to be some sort of singlehanded trials to replace the Laser (did they call them off? - or are they still on?). If I recollect, the singlehanded classes that made the cut were the most recent design additions in the mix; the RS Aero, the Melges 14, and the D Zero. And, of the most recent videos of these classes (within the past six months) Earwigoagin nominates this D Zero video as the winner. Disclaimer: No endorsement of any of these three classes is implied with this post. (My heart belongs to the Classic Moth.) 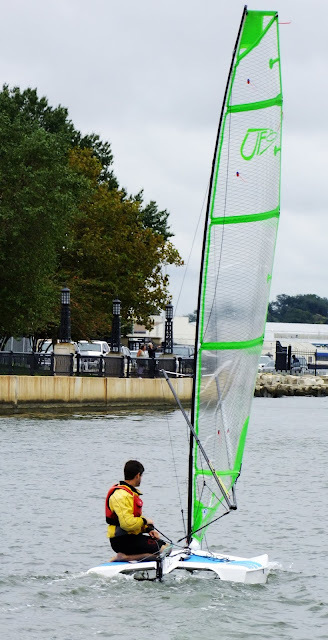 Click here to see some more of Earwigoagin's babbling about these (and other) singlehanded classes. B-class. 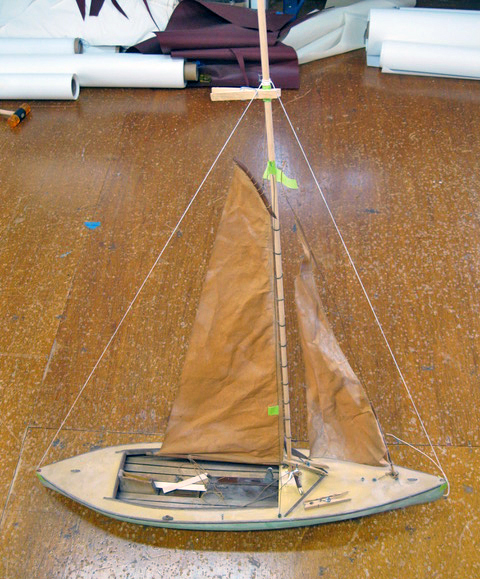 A 3.9 meter cat-rigged sailing canoe for young sailors. Max sail area 8 square meters. For a glimpse of a Swedish B-class kanot (blue hull with, what appears to be an OK rig at 1:20 and 1:58 into the video), click on the video in this post. Also, more info here. C-class - 4.8 meters to 5.2 meters. Max sail area 10 square meters. Minimum weight 81 kg. D-class - 5.4 meters to 6 meters. Max sail area 13 square meters. Minimum weight 360 kg. 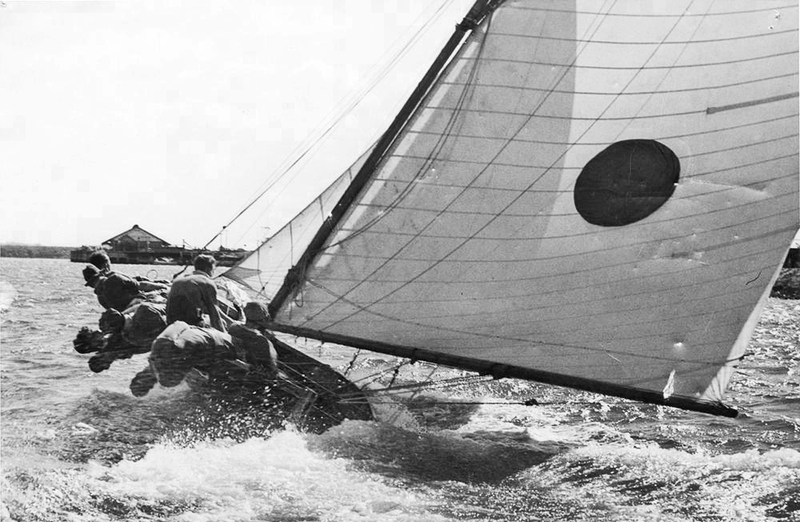 I've lifted the header photo from the website of boatbuilder Torsten Sörvik, who appears to be the kingpin of the Swedish D-class kanot's. E- class - 5.4 meters to 6 meters. Max sail area 13 square meters. Minimum weight 130 kg. The Swedish sailing canoes all feature hiking boards which extend the hiking skipper out about 300 mm or so. There is a German canoe class, the Taifun, of which I know very little, that also uses these hiking boards. 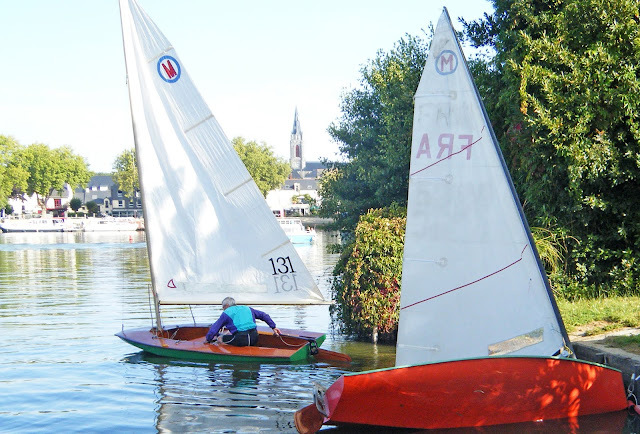 A video from this years Eurocup on a lake in Berlin shows both the International Canoe and the Taifun class racing. I must admit the Taifun looks to be a very sensible singlehander (or a two-hander for smaller crews). 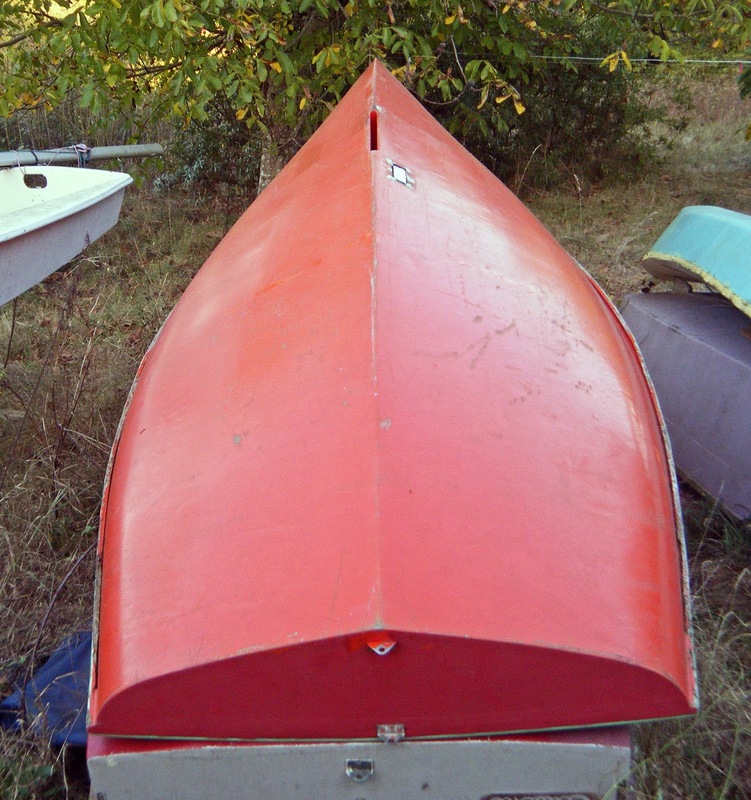 Click here for a more detailed post about the German Taifun sailing canoe. And a Taifun at speed. And a Taifun at speed, take 2. 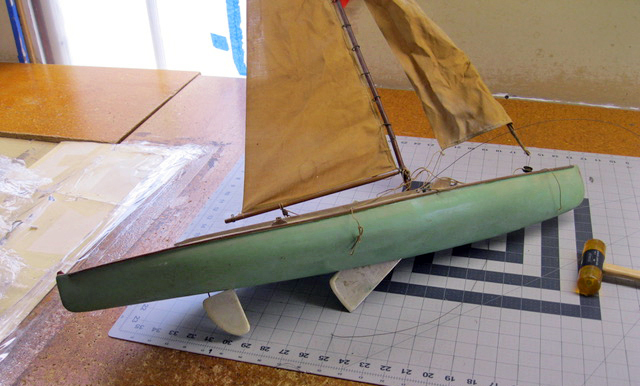 All this crusing canoe research was brought about when I was called upon to help identify a sailing canoe model that was picked up by sailmaker, Douglas Fowler. More about this later. Hands Up from Bryan Eckerson on Vimeo. A happy-happy, joy-joy boppy disco dance tune from the 1980's by the group Ottawan. You can glimpse occasional snippets of this old, baldish, be-spectacled guy with a yellow tie bouncing around. A family tradition but nuff said. Early on I discovered that if you switched out the header photo every now and then, you could write a post on that photo. If you do an image search on Earwigoagin's Header Photos you get a good snapshot of this blog. Blogging is, for the most part, an anonymous activity, but I have taken enormous satisfaction that some readers have enjoyed this blog and, also that some readers have been able to take away useful information. Thank you! Some of my posts that track the ups and downs of blogging. Some of my posts with personal anecdotes. Almost forgot. I would also like to thank Tillerman for ranking Earwigoagin as his best sailing blog of 2011. The previous header photo was the blogmeister idling around in his Maser before one of the starts of the 2015 Classic Moth Nationals. 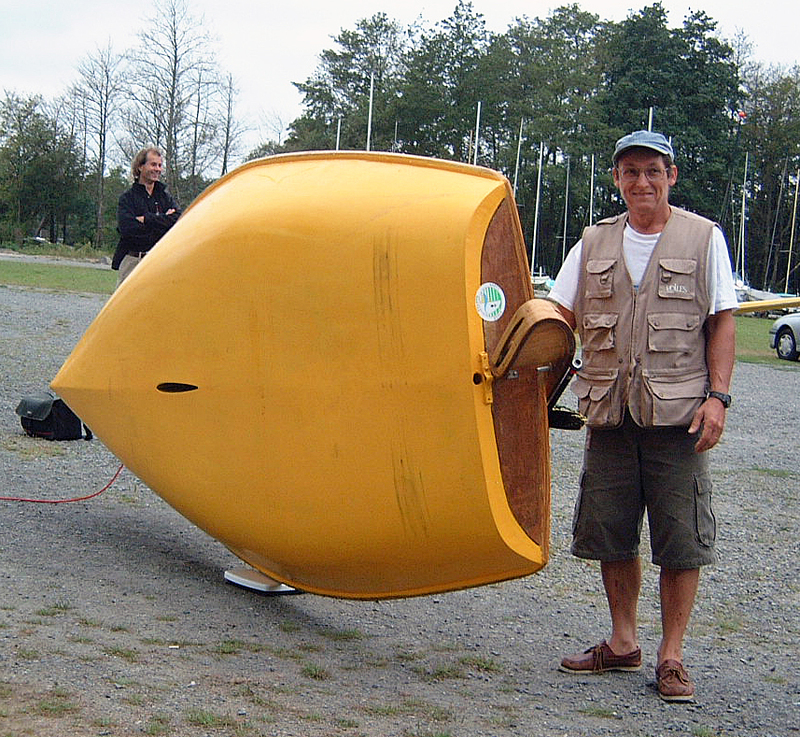 This fall I donated my Maser, number 105, (named Starkers as a Tip-of-the-Hat to her designer/builder, Randy Starks) to Joe Bousquet's expanding Classic Moth outreach to junior sailors. I haven't been racing much and felt Starkers would be better off with a younger skipper. Moth no. 105 was a good Moth. 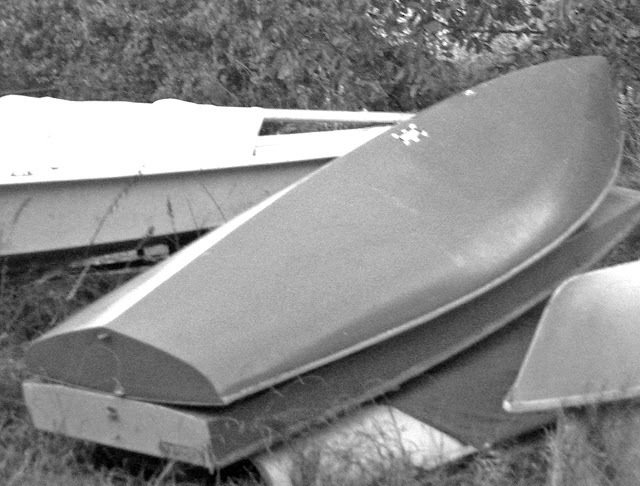 I treat my racing boats as anthropomorphic entities; they have human personalities and there was no doubt Starkers had a will to win. (Don't most singlehander's talk to their boats when racing? I even apologize to my boat if I do poorly in a race.). I like to think she was thankful at being granted another life, like a rescue dog, except in this case Starkers was brought back from an abandoned Laser hull and had a second life as a full-on racing Classic Moth. As a team, we won the trifecta of Gen 1 trophies, the Nationals, the Midwinters, and the Brigantine regatta. Great memories and I will forever have a soft spot in my heart for Starkers, this endearing mutt of a Classic Moth. Drone sailing videos are becoming a bit passé. 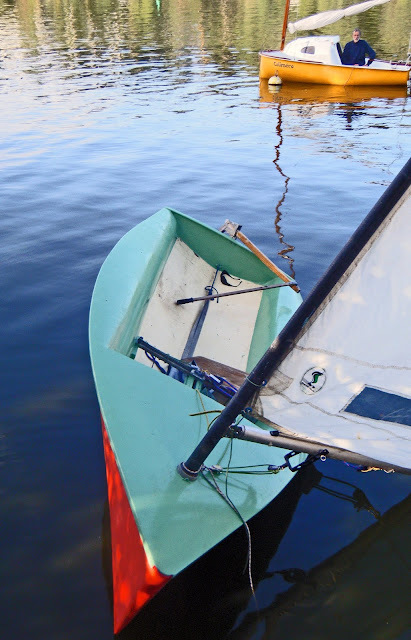 They work better for bigger boats, small dinghies seem to get lost in the distance. Like most techniques, judicious use in mixing drone shots with other camera work seems to work the best. Here is a video of exclusive drone shots that works, because, hey, these are the Volvo Ocean Racing machines and, in most cases, they were being launched and retrieved from the Volvo boats. Nothing like getting some out-of-the-boat video in the Southern Ocean. Best drone shots of 2017-18 Volvo Ocean Race from ClubRacer on Vimeo. 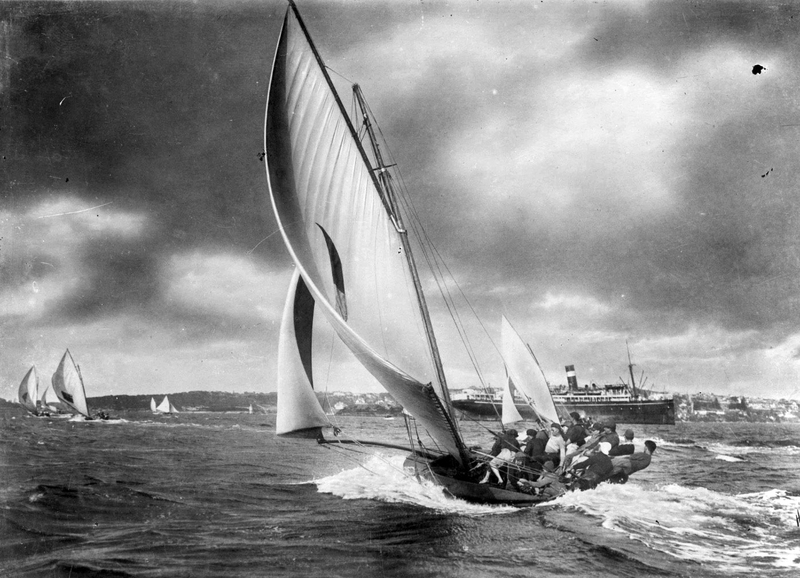 Some great vintage photos of the Aussie 18 have been filtering out at regular intervals from The Open Boat on Facebook. I'm reposting a couple on Earwigoagin. Music Whenever: Edward Sharpe, Magnetic Zeros, "Man on Fire"
I haven't put up a music video in a while. Hippie, stoner, Edward Sharpe and his musical troupe, the Magnetic Zeros, they, who keep the Woodstock vibe going in the new millennium, put this great video up to their song, "Man on Fire". Every once-in-a-while I throw some love out at our most popular Classic Moth, the Europe Dinghy. Not quite fifteen years after losing Olympic standing, the Europe Dinghy remains a popular singlehander in Europe. The following video is some good hi-speed action from Race 2 of the 2018 European Championship on Lake Garda. And the Race 3 video has more slo-mo and close-in shots of competitors. Although you won't see any at a major championship, there are some very beautiful wooden Europe Dinghies. And Classic Moth plans over here. 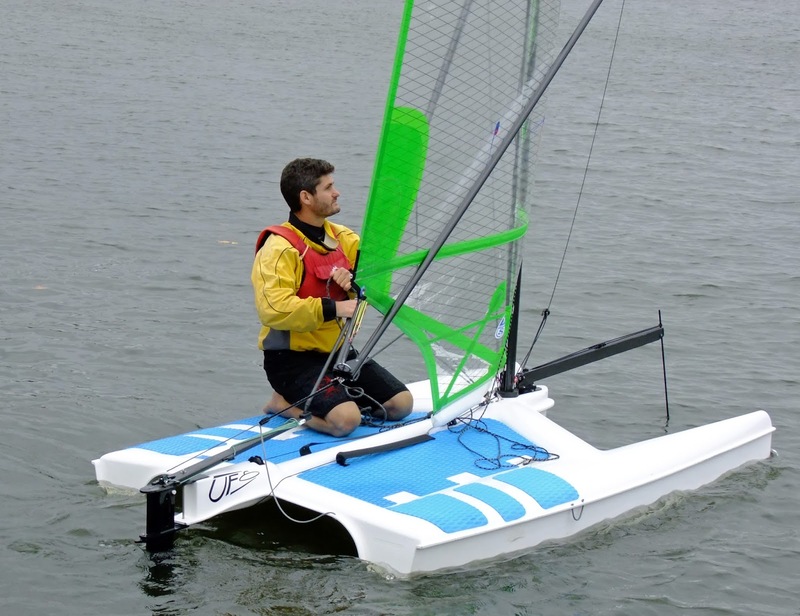 I've already posted about the UFO, the Clark design, short LWL catamaran entry into the foiling market. 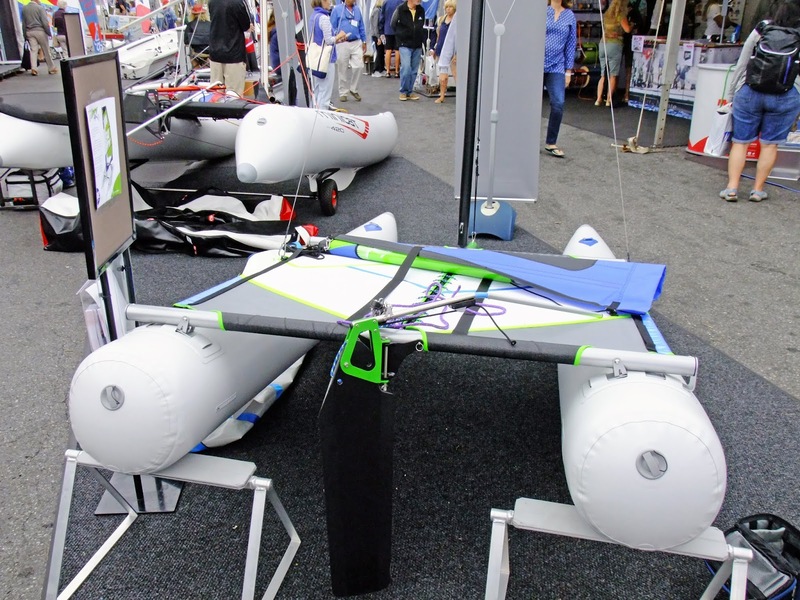 At this years Annapolis Sailboat Show, I was able to look at the UFO on the stand with the rig up and also watch it sail out of the harbor (they were giving demo rides at the show). Unfortunately, in my short time at the Sailboat Show, I only was able to see the UFO sailing in lowrider mode. According to Dave Clark they have now produced 200 UFO's and shipped all over the world. Lowrider Mode. 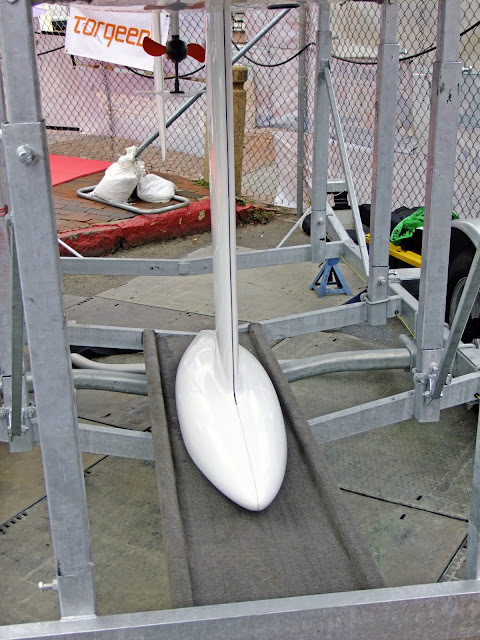 The bowsprit holds the wand which automatically controls ride height. 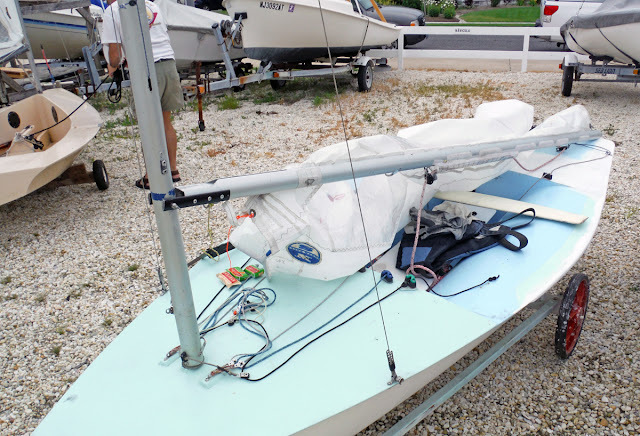 This is a big rig on a short hull, but, then again, the hull is not in the equation when foiling. 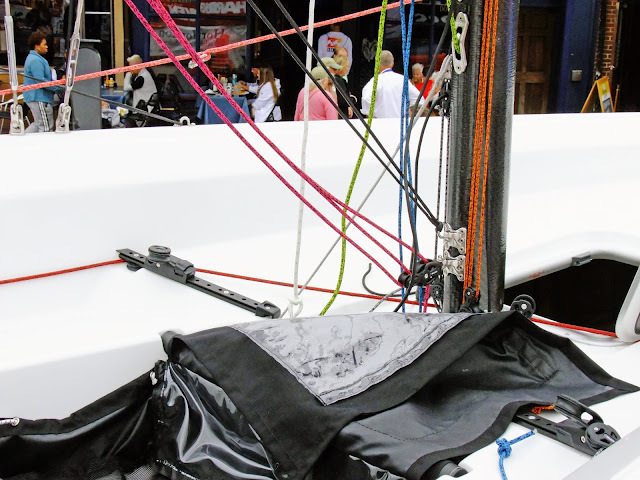 Modern fat-head, clear mylar mainsail. A brilliant solution to constructing the wishbone boom. 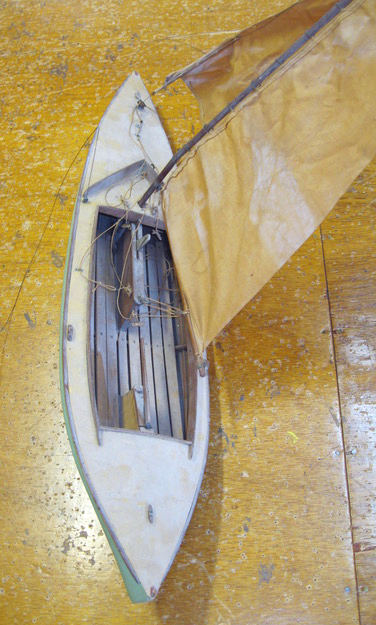 The front end is attached to the outboard end of the jumpers on the mast. You can use straight tubing and still get the wishbone away from the sail and the wishbone also adds leverage to get the mast to rotate in-line with the sail. Another shot of the end of the wishbone attached to the jumpers. The Classic Moth crowd here in the U.S is all abuzz about Swiss Moths, particularly the Swiss Dunand design of the early 1960's, as this design, in the hands of Joe Bousquet, just won the U.S. Nationals, breaking an almost 20 year string of wins by the Mistral design. 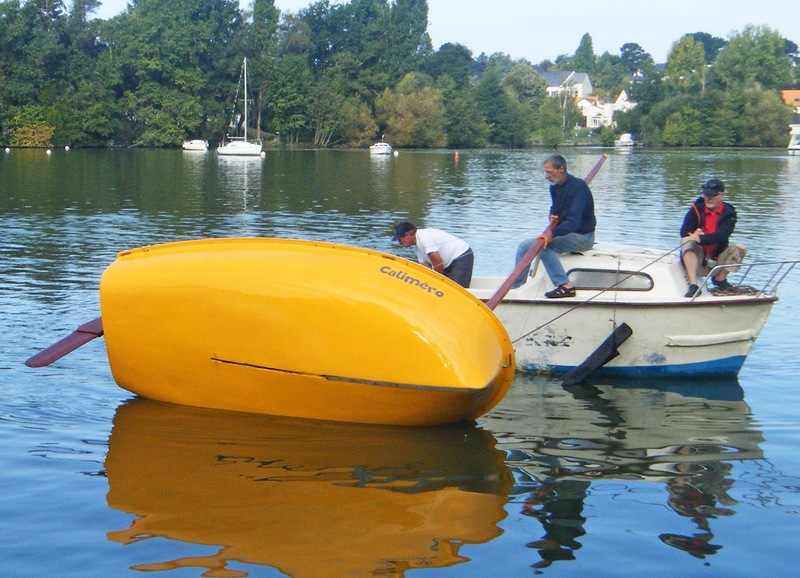 This post isn't about Bosquet's Swiss Dunand design (more about that in a later post), but rather about the fiberglass Swiss Moth which Bertrand Warion sailed at the French Moth gathering this past September. It seems to be another design variant which is always intriguing to a Classic Moth design geek like me. But a variant on what? 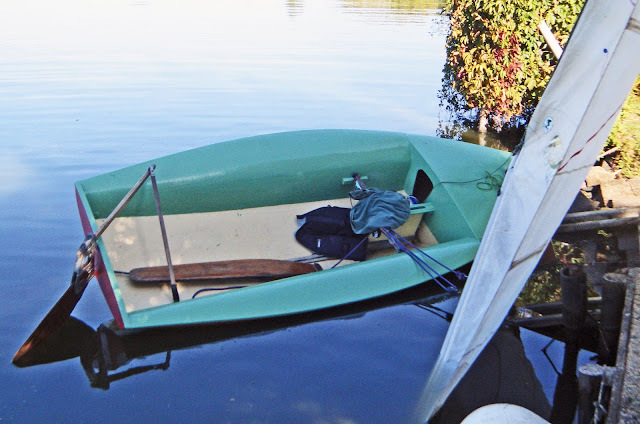 When I first looked at a photo of this Moth taken from above I thought, looking at the decks (which Bertrand installed), early Europe Dinghy (Europa) but when Bertrand sent more photos it is obvious this design is from the deep-V family, i.e. the Duflos or Mistral. Bertrand clarified in a follow-up email that it is a round-bilged variant on the Swiss Dunand design. However Bertrand's Dunand looks very much smaller than the American one that Joe Bousquet has just refurbished; Bertrand's looks almost like it was squished to fit into a Europe Dinghy deck mold. In this photo you can see in the reflections how the topsides fold up in a soft chine from the midships aft. The original Dunand design has a topside chine in approximately the same area. Bertrand's Moth has the shallow-V transom of the Dunand. The rocker line looks very similar to a Mistral. Bertrand finished the shell with his own decking in wood. The side tanks look tiny which is the old-style look. This definitely makes a commodious cockpit at the expense of more water sloshing about in a seaway. This is somewhat old news. I received an email back in May from Filio Shiavina that a group in Pondicherry (south-east corner of India) were building eight Y2K Mistral Classic Moths. We received a photo of the first one being spray painted. 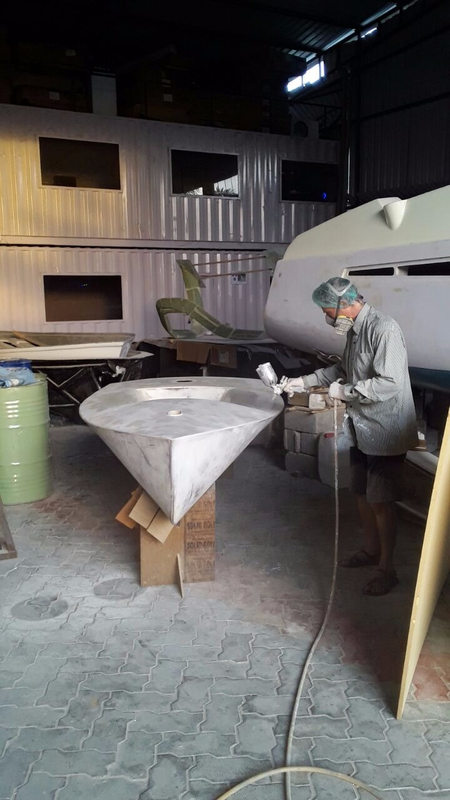 Lionel Mallard and son Nat, who own the Ultramarine boatyard are supporting the Moth building effort and I assume the following photo was from their shop. Since then no further news/pics have surfaced. Update, October 26, 2018: Joe Bousquet, who is on Instagram, came across several photos of the launch of one of the Pondicherry Mistrals, sans rudder. 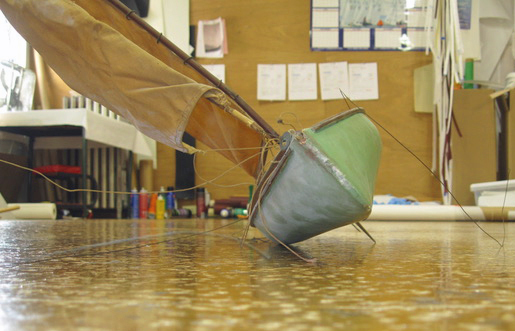 Seems like 15 year old Siam Mallard couldn't wait to build a rudder and launched his Moth with just a paddle for steering. The last photo had him a fair distance from the launching site. Oh, the courage of youth. Filio has been working on a 3D modeling of this mod Mistral. He noted one discrepancy in the offsets given in the post. We await some pretty 3D pictures of his work. For those who like their geography, here is the Google Map for Pondicherry (officially Puducherry in India). The previous header photo featured three Classic Moths from the 2018 French get-together on the River Erdre, just above the city of Nantes. 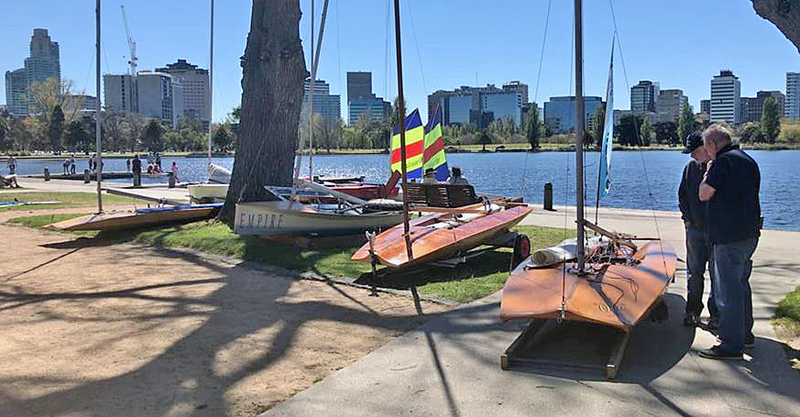 From the left, David Balkwill sailing a 1940's Nantais Moth, Jean-Yves, sailing his homebuilt Moth (built when he was 12; I'm guessing the 1960's), and on the right is Jean-Jacques Cadoret in the 1960's cruising Moth, Moth Béarnais de Camping. 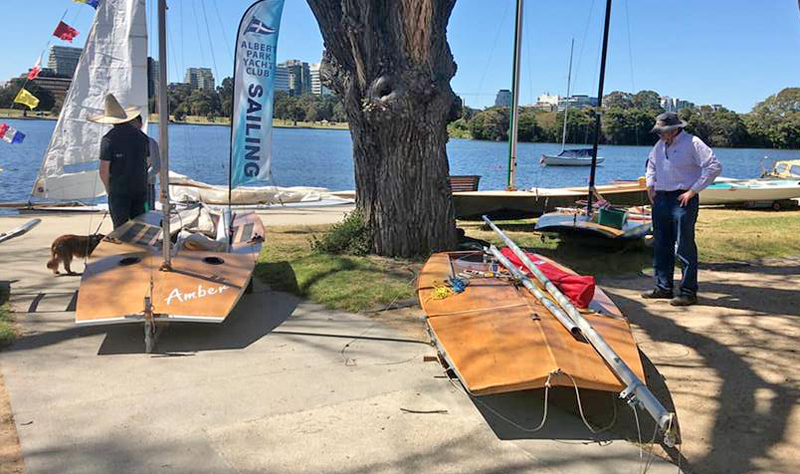 A week ago, six Classic (non-wing) Aussie scow Moths made it out on the small lake in the Melbourne city park, Albert Park. Rigging area. Not sure what the designs of these scow Moth they are but I imagine they are of the Imperium time-frame. The original Len Morris Olive made it outside the museum. Next to her is the Len Morris Mk II. 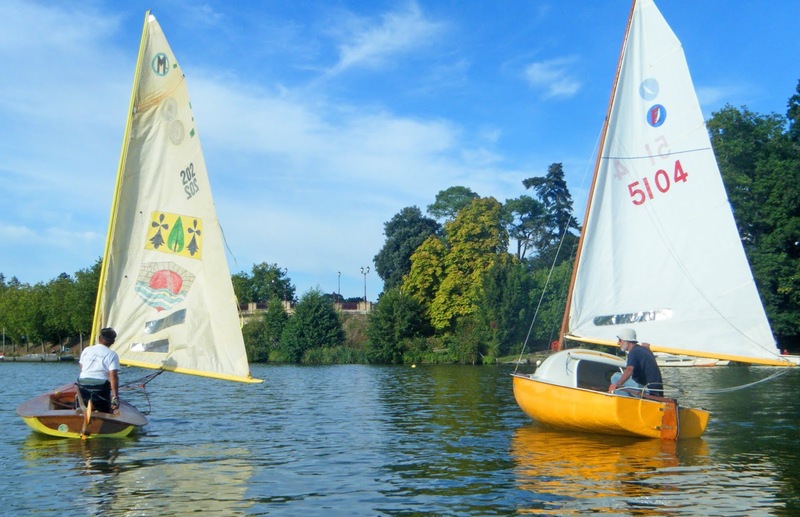 The scow Moths started with a Europe dinghy and a Laser Radial. We see a Solo dinghy and Sabre dinghy in the background, waiting for their start. Phil Johnson in his painstakingly restored Peter Cole Mouldie design. Photos originally appeared in Scow Moth Club group on Facebook. 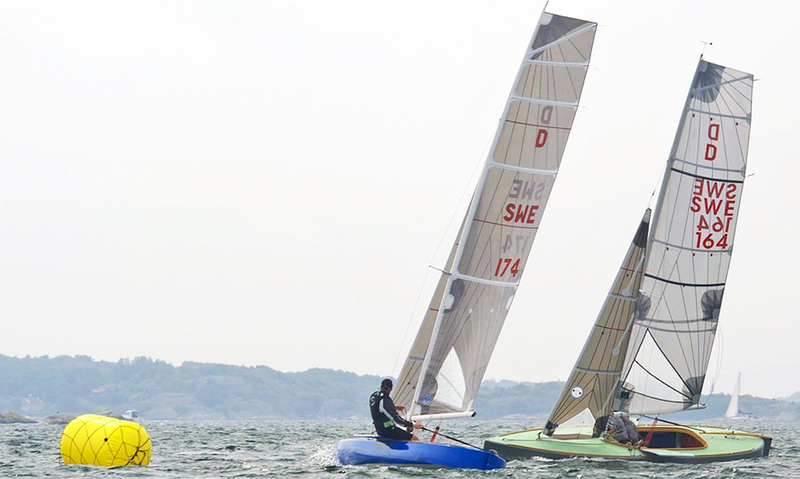 The previous header photo is an upwind leg of the 2017 Classic Moth Nationals at E-City. It was light wind that year and it appears to be light wind again this year. The 2018 Nationals are going on as I type this blogpost. They were postponed one month because of Hurricane Florence. I'm not attending because I've lost my racing motivation at the moment.